Amarin Corp. and Arena Pharmaceuticals were once high-flying biotech stocks. Since the commercial launch of their respective flagship products, though, their shares have fallen in a big way. In this article, I consider which stock has the better chance of recapturing its former glory going forward. But given their lingering popularity among retail investors despite their underwhelming performance, I think it's worth considering which stock offers the better growth prospects going forward. Amarin was supposed to blast off with the approval of its highly-refined fish oil pill Vascepa as a treatment for extremely high triglycerides back in 2012. The basic idea was that Vascepa should at least mirror GlaxoSmithKline's rival Omega3 treatment, Lovaza, in sales performance, but that never did materialize. According to Amarin's first-quarter earnings, Vascepa sales probably won't even hit $100 million this year, far off the blockbuster track. Amarin has thus been working vigorously to expand Vascepa's label. And the company's first attempt came and went with the so-called ANCHOR indication, which would have allowed the drug to be legally marketed to patients with only moderately high triglyceride levels. But as the story goes, the Food and Drug Administration raised a number of questions about the ability of fish oil pills in general to reduce the risk of cardiovascular events, leading the agency to ultimately reject Vascepa's label expansion for the ANCHOR indication. That hasn't stopped Amarin, though. Last week, we learned that the company filed suit against the FDA, on first amendment grounds, to permit the off-label marketing of Vascepa. Specifically, Amarin wants to be able to inform doctors about Vascepa's ANCHOR trial results because it "may" lower the risk of heart attacks and strokes in patients with moderately high triglycerides. Here's the kicker: I think Amarin has a really good shot at winning this legal battle against the FDA. Because it would be promoting the results of an actual clinical study and couching them in the terms of being "nondefinitive" at this juncture, it's hard to argue against that stance. It is a "true" statement after all, and a nearly identical argument held up, upon appeal, in the landmark narcolepsy drug, Xyrem, case last year. Meanwhile, Arena's story centers around its fat-fighting pill, Belviq (lorcaserin), approved by the FDA in 2012 and launched in the U.S. in June 2013. According to Arena's own projections, however, Belviq will probably end up falling short of $100 million in sales this year. The problem is that Belviq is starting to lose ground to newer FDA-approved diet drugs like Orexigen Therapeutics' (NASDAQ:OREX) Contrave, presumably because Contrave is simply more efficacious. All told, Belviq's blockbuster aspirations appear to be a pipe dream at this point, and investors should therefore begin looking at the company's other clinical candidates for reasons to hold onto their shares. 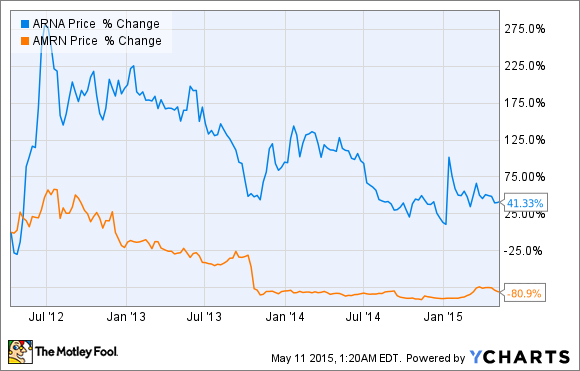 Is Amarin or Arena the better growth stock? This is an interesting comparison because neither stock is without significant risk. Amarin's saving grace appears to be that it has a decent shot at winning its latest legal battle against the FDA, and Vascepa sales have been growing at a respectable clip for its initial indication. The same can't be said for Arena's Belviq. The drug is probably on track to top out at $200 million in sales, most of which will end up in Eisai's pocket per its marketing agreement with Arena. That puts the onus on Arena's clinical pipeline to create value for shareholders moving forward. Unfortunately, the biotech's pipeline, outside of lorcaserin, won't produce any late-stage candidates anytime soon. So, I have to give Amarin the nod here. At the end of the day, I'd say it has the better shot at becoming a cash flow positive operation within the next five years, and there's no guarantee that Arena's pipeline will ever produce another viable drug candidate.